Lousy job: The potholes are causing traffic congestion as cars tend to slow down. 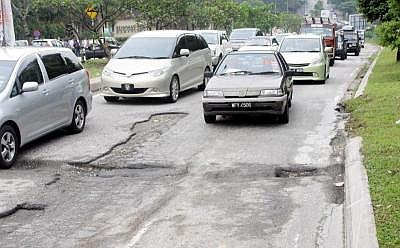 POTHOLES have reappeared in Jalan Burung Hantu, three days after Kuala Lumpur City Hall (DBKL) had patched up the affected stretch. Residents from Bandar Manjalara, Sunway SPK Damansara and Desa Park City were irked by the shoddy work. Many motorists said their vehicles had been damaged and the potholes were slowing down traffic, thus causing congestion. The residents have been complaining about the bad road condition for about three months. Chua Chew Huat, 57, from Desa City Park said it was wrong for the authorities to carry out a shoddy job. "Car tyres can get punctured if motorists keep driving on such bad roads. They need to do a proper job," he said. Stoney Liow, 58, from Sunway SPK Damansara said he could have done a better job using cement if this was the kind of repair work DBKL carried out. "The potholes have even caused accidents," he said. Lai Keun Ban, 55, from Bandar Manjalara, who moved from Malacca a year ago, was disappointed to see such bad roads in the capital city. He said the potholes were getting bigger by the day and accidents were becoming frequent. "The contractor who dug up the road and did not patch up the road properly and DBKL, too, did not do a good repair job. "This is just shoddy workmanship and a complete waste of money," he said. Segambut MP Lim Lip Eng said Jalan Burung Hantu did not even have a signboard to indicate its name. "Many complaints have been made about potholes and this is the most serious of all as it is causing traffic congestion. "We are not aware which contractor came to dig up the road and they just left without doing a good job. "The Kuala Lumpur mayor said DBKL had allocated RM200mil to repair roads next year, which is a waste of taxpayers' money. "This problem is not caused by the people, so DBKL should go after the irresponsible contractors," he said.